"I look for new challenges and battles because there is something eating away inside of me, a feeling of frustration when I can't build the project I had in my mind... But I keep building, because this is my dream. Something I can't and won't give up." 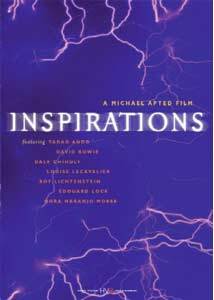 Before director Michael Apted (Nell, Gorillas in the Mist) took on the great scientific minds of the 1990s in Me & Isaac Newton, he turned his camera on the arts in this, 1997's Inspirations. For this study, Apted chose artists from a wide variety of disciplines: glass artist Dale Chihuly; aging pop painter Roy Lichtenstein; dancer Louise Lecavalier and choreographer Édouard Lock; clay sculptor Nora Naranjo-Morse; architect Tadao Ando and musician David Bowie. The structure of the documentary introduces each of the artists in the progress of their work—Lichtenstein pushing paint through a dotted stencil, Naranjo-Morse mixing clay with her feet—then breaks their monologues into areas of influence, working "on the edge," criticism and so on. The architect talks about gathering inspiration from nature, from music and even from paintings, which he then imagines into 3-dimensional forms. Bowie is seen choosing a headline from the paper somewhat haphazardly ("His Medals Questioned, Top Admiral Kills Himself"), then enters it into The Verbasizer—a software program he co-created that randomizes words in categories—until he sees something he fancies. Surprisingly, as an artist I found less inspiration here than I did in Me & Isaac Newton; perhaps there is still more mystique for me in things scientific than in the realm of the arts. I sadly discovered that artists, no matter what they say, speak from the ego in a way their left-brain counterparts do not. If the artist's work is creative self-expression, then indeed, this is somewhat expected. A medical researcher may find self-satisfaction (and even financial reward) in discovery, but the work continues on its universal path. Great, lasting art is the same, but these artists do not seem to recognize this when they discuss their process. I have a personal theory that art has become too self-conscious in the last century, and for the most part, these artists validate this concept. Michael Apted, however, does seem to understand this. As a documentarian, his signature is his absence. Yet, his guidance is present in the responses to his unheard questions, and in his quest to expose the nature of creative thought. The filmmaker is quite successful in drawing the artists' candor; in the end, however, one senses an unconscious disingenuousness. This said, there are many elements of interest here. David Bowie's computer-assisted process holds a certain fascination, the powerful musculature of Louise Lecavalier is surely inspiring and Édouard Lock seems to have a clear vision of his relationship to his audience. Perhaps, as the scientists of Apted's Newton captivated me, workers in science might find the offerings of these creatives minds a fresh resource for their inspirations. Otherwise, the image retains a highly film-like quality, with a level of grain that seemed pleasant to me but might read as too much movement on large screens. The source is clean and the transfer shows no digital artifacts, presenting the picture in a natural way. Audio Transfer Review: The audio is perfectly serviceable for the film's subject matter. All dialogue is clearly understandable, and the occasional music never interferes. Extras Review: The menu offers only two choices: to play the movie or go to the ample chapter selections. Again, as on Me & Isaac Newton, time and effort was given to the sub-menu, which this time scrolls horizontally. A little bit goes a long way on titles like these. Home Vision brings another fascinating Michael Apted documentary to DVD. The filmmaker's own understanding of the creative process makes this an important watch for those wanting a broader comprehension of the human mind.